Just wanted to wish you all a safe and Happy Halloween. 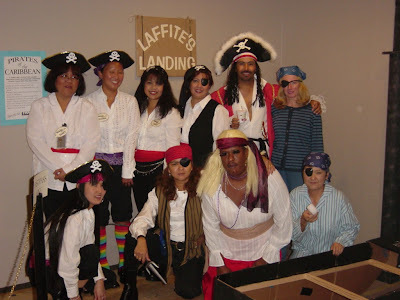 This is a picture at an office Halloween party where we did the Pirates of the Caribbean. Our Halloween series will continue through the weekend. 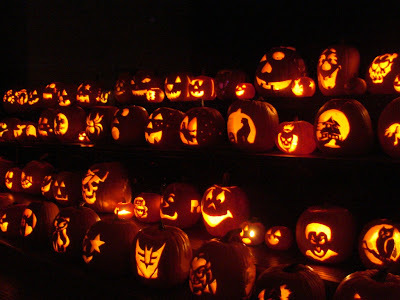 Glowing jack-o-lanterns galore done by students and their parents at Pearl Ride Elementary pumpkin carving nite. I must say it was an awesome sight to see so many pumpkins in one place and another sign that Halloween is right around the corner. Burnt Tree at Manoa Chinese Cemetery. This tree is said to be a porthole for spirits and is also where supposedly someone set himself on fire partly burning the tree. 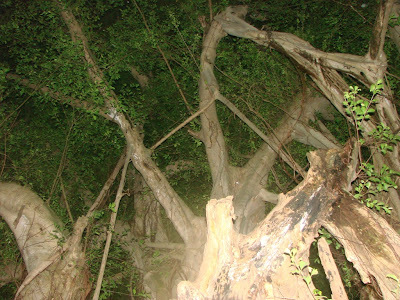 Other stories tell of lightning striking the tree multiple times and of ghostly orbs of light floating around the tree. This picture was taken on the Orbs of Oahu tour done by Oahu Ghost Tours To find more material about Hawaii and Japanese ghost stories visit check visit our Global Hawaii Blog Bookstore.